DIY Fairy Lights: LED fairy string lights are made of flexible and durable copper wire; the mini cute string lights can be easily and freely bent and shaped around potted plants, bell jar, Mason jar, wine bottles and anything you want to decor. Ideal for interactive DIY decor for parent-child couples and family members etc. 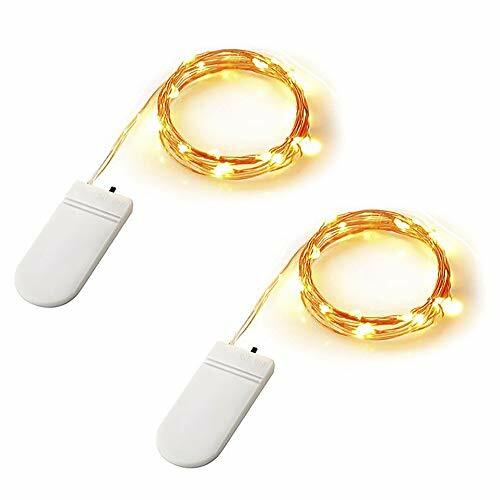 Waterproof String Lights: IP65 waterproof string lights bendable but sturdy with insulated lacquer are totally submersible (except the battery box). The copper wire part can be immersed into water to create a shining and amazing effect. Just enjoy your magical time with your family or friends. Battery Operated Starry Lights: Each set of lights uses 2X CR2025 batteries( Included and can be replaced), supporting over 48 Hours Non-Stop Lighting and much longer time when used with intermittent rest. The battery box only with ON/OFF switch, easily control the beautiful effects. Wide Usage: 360° angle sparkle for a optimal effect. Perfect for home party wedding Christmas Halloween garden patio or put the fairy lights into a wine bottle or anywhere you like to decorate. Safe to Touch: Low power & heat insulated copper wire make the fairy star lights more pleasant for your eyes and safe to touch. These lights are perfect for decorations. I plan on using them in mason jars for a party. This strand was a little longer than I needed them to be, but they work quite well.